Over the last 12 years, Youtube has become the biggest music & video database in the world, the most influential media resource which tells who's popular and who's not, and, of course, it's the main platform for discovering new music, both for artists and music lovers. You can find there literally everything – from cute kittens to complete albums to rare live concerts (check out a Nirvana's archive live performance which came out in July 2017). Anyone can share anything with the world - that's why everybody loves Youtube. If you don't know Youtube has paid subscription service called Youtube Red. It offers ads-free streaming from Youtube, offline playback, and background playback on mobile devices. Who wouldn't like it? Having no Youtube would equal having no Internet or no mobile. Sadly, Youtube was originally created as a video streaming service, and streaming presupposes no downloads. As a result, you can't save a video or rip music from a video (unless you use special tools). But more and more people are trying to convert Youtube videos to MP3 to later upload them to their mobile devices. But what if I told you there's an option that doesn't require converting a video to MP3 but allows you to listen to Youtube clips offline, without a video and foremost, for free. Whatever video people upload to Youtube, the audio quality is automatically converted to WebM supported by Vorbis (lossy audio format). It means that you can't find High-Quality music there. But Youtube isn't intended to provide Hi-Res sound, so converting mediocre quality to even worse is leaving you with 60% of the original sound. Converting a Youtube video to MP3, especially a long one, like Pink Floyd live convert, can take some time. Why waste time first to convert something a then spend even more time downloading the converted file? How to avoid these inconveniences? You might have not heard about this option, nevertheless, it's not only the fastest way to listen to Youtube audios, but it's also very easy and convenient. The secret lies in the player itself. You no longer need to download, or convert anything. VOX does everything for you. When the player is open, press cmd+U and a window will appear. Past the link you the video and press OK. The track from the video will instantly appear on your Playlist. With this feature, you can mix your local library with some rare Youtube clip thus making a unique playlist made of favorite tracks. Youtube player for iOS is currently being developed. What other feature does VOX have? VOX Music Player for Mac & iPhone accents the quality of the playback. This audio player supports a huge range of audio formats, both lossy﻿ and lossless. The sound is that good due to the sound engine enhanced by a brand-new sound engine with an excellent bass technology. 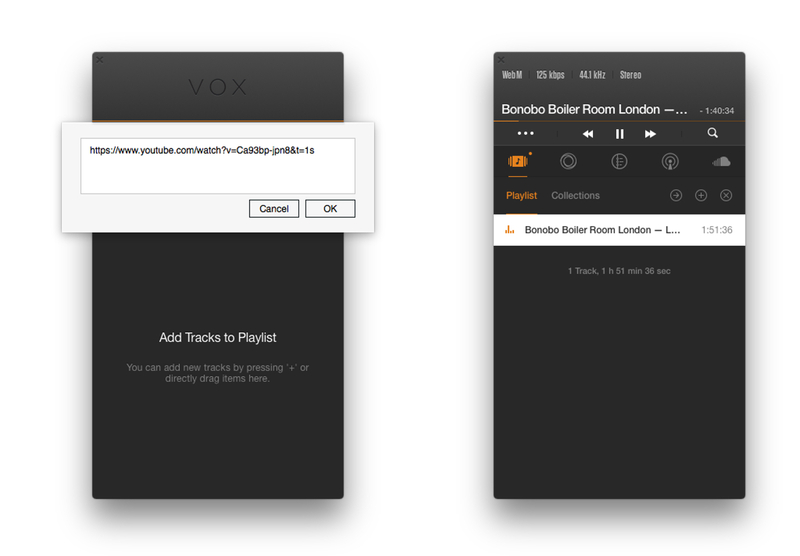 Even more, with VOX Cloud you can syncs music collections on all your Apple devices. VOX Cloud (formerly LOOP Unlimited Music Cloud Storage) is an unlimited cloud that stores all your music. 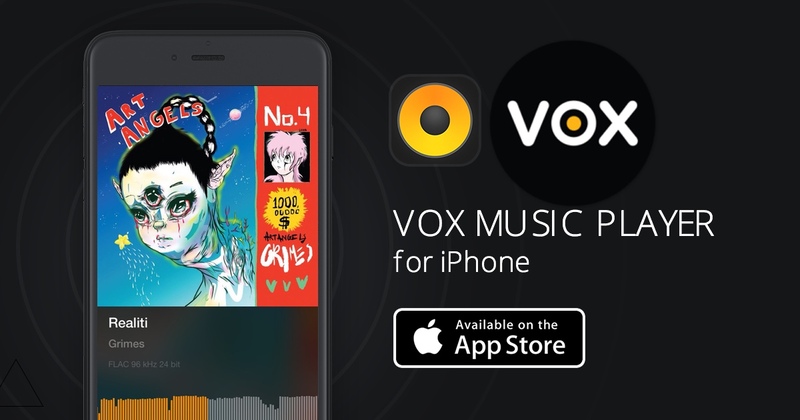 You upload music to it, and it instantly appears on all the devices connected to your VOX Premium account. In this way, you can listen to Hi-Res Music on your iPhone without converting it to MP3 or whatever. If you might be having Internet data for some time, you can always download some tracks to your iPhone to listen to them offline. VOX Music Player has a very easy interface without useless features. That's what happens when audiophiles create a player for audiophiles. Lossy and lossless formats support. Sync your Spotify and SoundCloud accounts for best music experience. Scrobble to Last.fm to keep your current listening stats. VOX Music Cloud – Unlimited Music Storage. As you see, the world doesn’t come down to converting video to MP3 when you want to listen to some of the audios from Youtube. It's just a matter of what tool you tend to use. My choice – VOX Music Player for Mac & iPhone. From all the ways of listening to Youtube tracks, the most convenient one is with VOX Music Player. Add the tracks to your collection and enjoy the music with no worries about conversion. Everything is super simple. Enjoy your music to the fullest!